6th February 2019, beloved husband of the late Alice, loving father of Jeffrey, Joy and Jacqueline, father-in-law of Anna, George and Peter and a much loved grandfather. Funeral from his home, 16 Baronscourt, on Saturday at 10.30 am for 11 o’clock Requiem Mass in St. Patrick’s Church Pennyburn. Interment afterwards in the City Cemetery. Family flowers only please. Donations in lieu if wished to N.I. 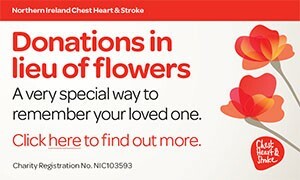 Chest, Heart & Stroke, 21 Dublin Road, Belfast, BT2 7HB. Queen of the Most Holy Rosary pray for him. I am sorry to tell you that Colm GIBBONS has passed away.